We maintain a large and diverse inventory of interior and exterior paints, finishes, epoxies, stains, and coatings from today's leading brands, such as Benjamin Moore, PPG, AFM Safecoat, Ellis, Devoe, Epoxy2U, and Americoat. Our prices are competitive with "big box" stores, but our selection and service are unparalleled. Our team excels at installing carpet, hardwood, laminate, vinyl, tile, and waterproof flooring for residential, commercial, and industrial clients. Come to our showroom to view 100s of floor samples and schedule a free onsite consultation. We carry residential, commercial, and industrial grade waterproofing and deck coating systems from Desert Brand and Pacific Polymers. Our high-quality waterproof sealants and coatings are highly effective at protecting wood, composite, concrete, and metal surfaces from the damaging effects of water intrusion, such as corrosion, mildew, deterioration, and structural damage. Your choice of window covering can completely change the look and feel of your interiors, by allowing in more or less sunlight, complementing or matching your color scheme, and cooling or warming your indoor space. Our experienced staff will help you choose the right blinds, shades, or shutters to achieve your vision and expertly install them for a perfect fit. 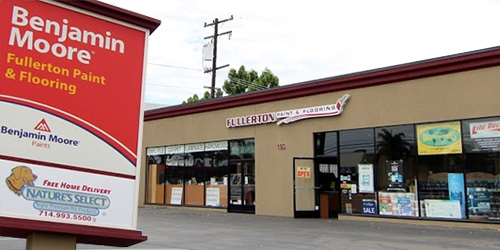 Fullerton Paint & Flooring Has You Covered! Welcome to Fullerton Paint & Flooring, the best choice for paint, flooring, and window treatments in Orange County. We are an independently owned paint supplier and flooring company that has provided thousands of satisfied customers throughout Fullerton, Anaheim, Anaheim Hills, Yorba Linda, Placentia, Orange, Brea, La Habra, Whittier, Brea and surrounding communities with exceptional value since 1995. Our repeat business is built on building relationships, finding the right solution for each customer, offering quality products, and delivering superior results that consistently meet or exceed expectations. Clients choose us time and again because we provide the personal attention, product selection, and thorough knowledge that "big-box" stores just can't match. At Fullerton Paint & Flooring, you'll find solutions for every surface. For those looking to paint and protect interior or exterior walls and floors, we carry high-quality architectural paint, primers, and coatings, including industrial and specialty coatings for waterproofing. We are authorized dealers for Benjamin Moore, PPG Pittsburgh, Ellis Paint, Pacific Polymers, AFM Safecoat, Rust-Oleum, General Finishes and several other trusted brands. Because of our staff's extensive experience and product knowledge, you can rely on us to recommend the best products and provide guidance on application procedures and maintenance. For those interested in all new flooring, we offer competitive pricing and expert installation of carpet, vinyl, waterproof, tile, laminate, and hardwood flooring. Additionally, we can custom fit and install window coverings and treatments, such as roller shades, blinds, and shutters, to complement any design. Whether you are a do-it-yourself homeowner, professional contractor, or commercial facility manager, bring your paint, flooring, and window covering questions to us, and we will provide the answers and recommendations you need to successfully complete your project. Give us a call or visit us at our 5,000 sq. ft. facility and showroom in Anaheim to browse our wide selection of architectural paint, flooring, carpet, and window treatment options. We can take your order and have it ready for pick up at our store or have it delivered or shipped to your address. Our prices are always competitive, and we offer contractor and volume discounts.